Gasoline is highly inflammable, and this necessitates environmentally safe disposal mechanisms. Our world often revolves around gasoline. It is required to power up generators, automobiles and various farm machinery like tractors. There are legal frameworks that have been created for the safe disposal of old gasoline, and you need to check with your county legal affairs for guidelines. Unsafe disposal of gasoline can harm the environment and destroy the ecosystem. Depending on the length of time that the gasoline has remained unused you may want to know whether you can mix it with new gasoline and use it. Contaminated gasoline has a dark color and a sour smell. If the gasoline has not being used for many months, then it is time to dispose of it. Find a government recommended disposal container and pour the contents there. There instances where the old gasoline has lost its potency; you can dilute it with new gasoline and use it for running some of the farm machinery. In every area, there are allocated spots for the safe disposal of gasoline and other hazardous substances. You will need to research online for the nearest spot or call your local city waste management disposal unit. Most of the disposal centers charge a fee for the service. Go prepared with some loose cash. If you have a large quantity of gasoline, then it would be prudent to hire a private waste disposal company. You can find these services through a search engine search. The private waste disposal units will come for gasoline and take it to their centers for safe disposal. Private firms are more expensive than public firms. In some localities, the municipal council organizes regular events where they teach the community of safe disposal. They also let the citizens bring their old gasoline for safe disposal. Inquire from your community when the right day is for gasoline disposal. 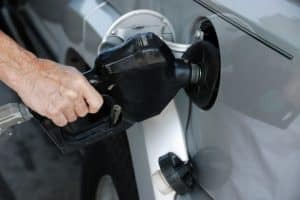 Auto repair shops often deal with gasoline, and you can contact them to dispose of your old gasoline. Most of the auto repair shops also have oil and brake fluids that they need disposed of. Be friendly with them, and they may extend the service to you for free. You should avoid discarding the old gasoline with your normal trash because it is highly inflammable and can cause fires. It is also not recommended to flash out the gasoline in your water system because it can come into contact with water used for domestic use. Each country has put in place penalties for anyone who does not follow the procedure for safe disposal of gasoline. Find a gasoline approved container and pour your old gasoline there. Most of the containers can handle up to 5 gallons. The container comes with a seal that prevents the leakage of gasoline. You need to be extremely careful when handling gasoline because any spills can be dangerous when they come into contact with a flame. If your clothes come into contact with gasoline remove them immediately and wash them with soap and water. You can use baking soda solution to clean off any area that has gasoline spill-off. Wash clothes repeatedly until the smell of gasoline diminishes. You should never smoke or be near someone who smokes when you are handling gasoline. A small spill can cause serious fires when it comes into contact with a cigarette. It is also dangerous to inhale some of the gasoline fumes. In case this happens, and you start feeling dizzy seek medical help. If you accidentally swallow gasoline drink milk immediately. Wash your eyes and hands with cold water and soap after handling any gasoline. If after 15 minutes you notice that your hands have a burning sensation then seek medical assistance. Ensure that you keep old gasoline from the reach of children. Children tend to be curious, and they can consume the gasoline assuming it is water. Not all of the old gasoline needs to be disposed of. With a little filtering, you can reuse your old gasoline. The first thing you need is to pour the old gasoline into a funnel with a filter at the bottom. This will rid your old gasoline of any contaminants and deposits. Alternatively, you can use a clean cloth to filter off deposits. The old gasoline can then be used to run your lawn mower or grass cutter. The old gas can still fire up an engine, but you may need to mix it with new gasoline. It is advised when you are mixing the old gasoline with new you add some fuel additives. This helps break down any unwanted substances in the old gas. When disposing of the old gas always ensure that the gas container is in an upright position. This prevents it from tipping over and spilling. Old gasoline can be reused, but you need to be careful about how you handle it. Gasoline is highly inflammable, and you will need to avoid smoking when dealing with it. Every country has put in place legal guidelines to help in the disposal of old gasoline. The first thing you need to determine is whether the old gasoline is reusable. You can check for odor and presence of contaminants in the gasoline. A simple filtering process can remove contaminants, and you can then go ahead and mix the old gasoline with new. You can use the old gasoline to pour up some of your farm machinery like the lawn mower. If the old gasoline cannot be reused, you can dispose of it through country approved disposal centers. You can also request the local fire station or auto repair shop to dispose of the old gasoline for you. Always ensure that you use the recommended containers for safe disposal of gasoline. Avoid pouring old gasoline in the sewage system as it can cause harm to the environment. Should you accidentally swallow, gasoline takes milk immediately and consult a doctor if you continue feeling dizzy.